1) Srsti Kali: She has the Will to create and has an idea as to what they are going to be. She is known as Srsti Kali. This is the nascent idea of creation by Kali of the object. In this stage Kali is gathering knowledge, the stage of PramAna ( = Knowledge and means of Knowledge). 2) Rakta Kali: She is concerned with Sthiti or maintenance of the visible world by the five senses. Here Kali wants to preserve and protect the object she created through the five senses. .
4) Yama Kali: She manifests herself beyond extrovert or introvert aspect and represents the AnAkhyA, indefinable power in relation to objective experience. 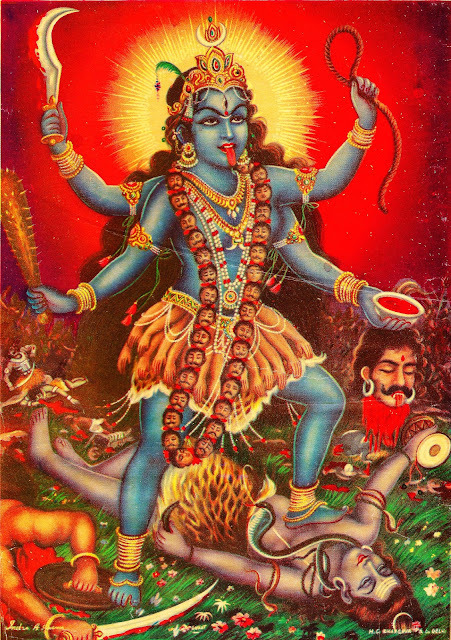 She goes beyond subject (KAli) and object paradigm to a realm, where the consuming energies of 12 Kalis abide. 5) SamhAra Kali: When Parasamvid, Her Highest Divine Consciousness withdraws into Her all external objects and makes them identical with herself, the aspect of SamhAra Kali emerges. In this aspect of SamhAra Kali, she tells Herself, 'the objects are non-different from me.' The subject and object are one and non-different. Read the lyrics, 'I Am The World' below. 6) Mrtyukali: In this aspect, Mrtyukali engulfs and swallows SamhAra Kali, and internalizes the residual objects and traces of the objective world. This is Sthiti (= maintenance) in the stage of PramAna (= means of knowledge and Knowledge). 7) Bhadrakali: The objects dissolve in Bhadrakali's essential nature. This is SamhAra in the stage of PramAna. Her other name is Rudrakali. 8) MArtanda Kali: MArtanda is sun or god of Sun. 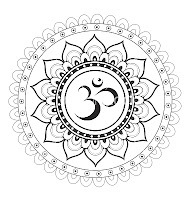 The cluster of 12 Indriyas or organs is called sun because they illuminate the objects like the sun. The 12 Senses are five sense organs, five motor organs and Manas and Buddhi. She dissolves the 12 senses in Ego or Ahamkara. She is AnAkhyA, indefinable power in relation to PramAna, the means of Knowledge. She goes beyond the PramAna paradigm, where the consuming 12 Saktis abide. The 12 senses have lost their name and individuality upon dissolution in Ego. What she created, she is absorbing : the body, the senses etc. Senses and body are gone. The four stages of Kali from 9 to 12 represent Kal's four powers in relation to ParamAta (= the limited subject with only Anava Mala). 10) KAlAgnirudrasakti: When Parasamvid, the Highest Divine Consciousness, merges the individual soul with the Universal Self, she is called KAlAgnirudrasakti. Kali represents the power of Sthiti (= Maintenance) in relation to PramAta ( = the limited subject) to rest in Her Universal Self. The Subject dissolves in the Consciousness. The experience of KAlAgnirudrasakti at this level is, 'I am all this.' Her other name is MahakAli, because She has in Her everything inside Her including Time. 11) MahAkAlakAli: She dissolves the individual 'I' in the universal Perfect 'I' which is free from all objects. This is the ultimate absorption or SamhAra in relation to limited subject. 12) MahABharaiva-Ghora-CandakAli: This state of Kali is AnAkhyA in relation to the limited subject. This is beyond all characterization in words. This is Akula stage (= Siva). Here PramAtA, PramAna and Prameya (subject, means of knowledge and object) are all dissolved in I-Consciousness. This is ParA (= Supreme or highest) because all previous states are her manifestation ante Akula state is Siva state. The other name for MahABharaiva-Ghora-CandakAli is MahABhairavaGhora CandaKali, where in Canda is the realm of Prameya (=Subject), Ghora is Prameya ( = Knowledge and means of knowledge), and MahaBhairav is PramAtA ( = Subject). Jai Maa Kali.Very good information.